The HSPA910CF Common Footprint (CF) Socket modem is a PTCRB and Carrier end device certified HSPA+3G cellular modem for use on GSM based networks globally. End device certification allows users to implement the HSPA910CF in their devices with no further North American carrier certification requirements. 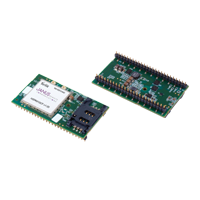 Incorporating the TelitHE910G (see link below) quad band module, the GPS enabled Janus HSPA910CF is available for use on AT&T, T-Mobile, Rogers, Bell, and Telus networks, as well as all other GSM networks worldwide. It is pin compatible with the full line of Janus Common Footprint (CF) Plug-In products.